Results: Like the best movers in town, nanoDESI quickly transports delicate chemicals and proteins to their destination in one piece. Created at Pacific Northwest National Laboratory, nanoDESI—or Nanospray Desorption Electrospray Ionization—picks up molecules from substrates and transfers them to a mass spectrometer for analysis. Because this technique is very sensitive, scientists obtain detailed data using nanogram-sized samples. 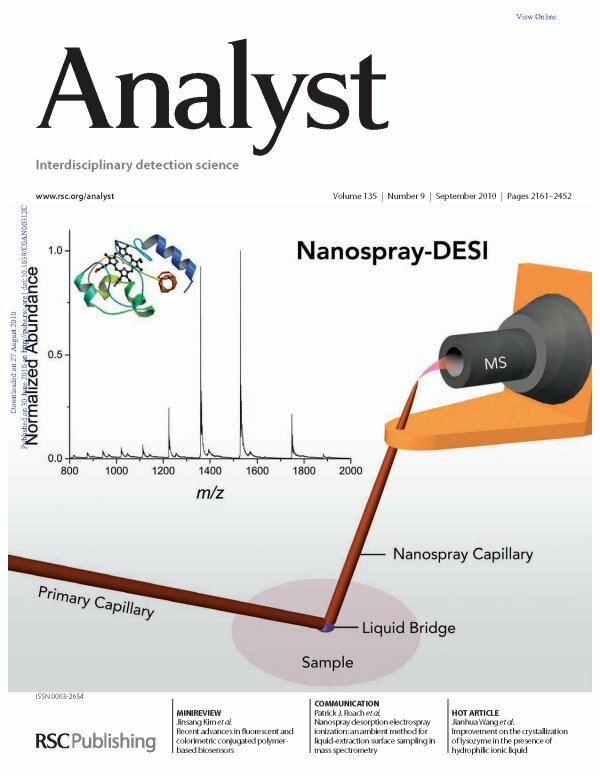 nanoDESI graced the September 2010 cover of Analyst. Why It Matters: What if you could use smaller samples of rare bacterial proteins or air pollutants, skip the laborious sample preparation process, and still get precise data? With nanoDESI, scientists now can. The sample can be 1000 times smaller than those used in more traditional approaches. "nanoDESI makes analyzing the organic aerosols involved in atmospheric haze far easier,” said Dr. Alexander Laskin, an aerosol chemist at PNNL. Methods: Now available to others through EMSL, a national scientific user facility, nanoDESI uses a liquid bridge to move the sample from a substrate. The bridge is maintained by pumping the solvent onto the sample and drawing it off the sample using two glass tubes or capillaries. One capillary pumps a continuous stream of water, alcohol, or other solvent onto the surface. The solvent dissolves the sample. A second capillary transforms the liquid into charged droplets that are pumped into and analyzed in an LTQ-Orbitrap high-resolution mass spectrometer. What’s Next? The team is planning to use this technique for analysis of a broad range of environmental and biological samples. For example, nanoDESI will be used for analysis of oil samples and chemical imaging of Shewanella oneidensis, a common microbe of interest to cleaning up contaminated nuclear weapons sites. Reference: Roach PJ, J Laskin, and A Laskin. 2010. 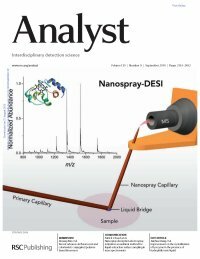 “Nanospray Desorption Electrospray Ionization: An Ambient Method for Liquid-Extraction Surface Sampling in Mass Spectrometry.” Analyst 135(9):2233-2236.